Forces loyal to dissident Congolese General Laurent Nkunda will not integrate in Congo 's national army, despite the extension of an October 15 deadline, a rebel spokesman said Tuesday. Noel King has more in this report from Kigali. The situation in eastern Democratic Republic of Congo is reported to be tense as a government deadline for rebel fighters to join the army draws near.President Joseph Kabila has given fighters loyal to renegade General Laurent Nkunda until the end of Monday to lay down their weapons. Rebels and foreign observers have said they expect the army to attack soon after the deadline. 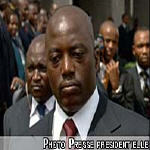 In the Democratic republic of Congo, the leader of the rebel National Congress for the People's Defense (NCPD) said his forces would not be able to abide by President Joseph Kabila's ultimatum of laying down their weapons today (Monday). General Laurent Nkunda said the agreed area of Mushaki where the rebels were supposed to assemble to be integrated into the national army has come under heavy government gunfire, making it impossible for them to abide by the government's ultimatum. Rebels in the eastern Democratic Republic of Congo are refusing to disband and disarm, one day before a deadline set by President Joseph Kabila. Kabila arrived Sunday in the Nord-Kivu province capital of Goma a day ahead of an ultimatum to rebels loyal to renegade general Laurent Nkunda to disarm or face a new offensive by the Congolese armed forces (FARDC). Kabila arrived in Goma at 9:30 local time accompanied by the defense minister, the army chief of staff and the minister of humanitarian affairs. A renegade Congolese general who shattered a U.N.-mediated ceasefire earlier this week has performed a hasty turnaround, demanding a halt to the violence that has killed dozens of his men. 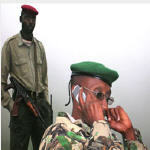 A renegade general in eastern Congo says government forces have launched new attacks on his positions and that he has no choice but to keep fighting until the government listens to him and lets him rejoin the army. In the Democratic Republic of Congo (DRC), the leader of the rebel National Congress for the People's Defense, General Laurent Nkunda has dismissed as propaganda government reports that he broke the over a month old ceasefire agreement. 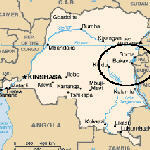 Nkunda said his forces were the first to be attacked by government soldiers, before his group returned fire. He said he had instructed his forces to be in active defense, but not to go on the offensive against government troops, unless they are attacked. Nkunda is now accusing the government of trying to plunge the country into war. 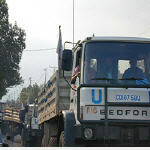 Chronic violence in eastern Democratic Republic of Congo has cut 150,000 vulnerable people off from humanitarian aid, deepening an already severe crisis, according to the UN World Food Programme (WFP). 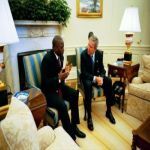 The White House says President Bush will meet with his counterparts from Liberia and the Democratic Republic of Congo in Washington later this month.